The previous two meetings between the Michigan basketball program and Arkansas were played on high-profile stages. In 1997, Maurice Taylor had 19 points and 15 rebounds as the Wolverines routed the Razorbacks by 15 at Madison Square Garden in New York City. Two days later, Michigan won the 1997 National Invitation Tournament title. Three seasons earlier, Juwan Howard and Jalen Rose played their final games in a Michigan uniform as eventual national champion Arkansas ended the Wolverines' run of two straight Final Fours with a 76-68 victory in an Elite Eight game of the 1994 NCAA Tournament in Dallas. On Saturday, the lights won't be as bright, but Michigan and Arkansas will meet again (2 p.m., CBS), as the Wolverines make their first trip to Fayettville in 31 years to play the first leg of a home and home series with the Razorbacks. 1. Is Hardaway emotionally sober? 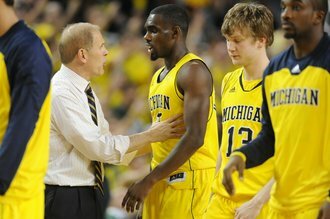 Michigan coach John Beilein and Tim Hardaway Jr. talk Tuesday during a timeout. Tim Hardaway Jr. struggled to play within the flow of the offense in the first half against Michigan State earlier this week. The 6-foot-6 sophomore missed two hurried 3-pointers and finished 0-for-3 from the floor during the first half, once again looking frustrated and anxious. Michigan coach John Beilein was seen on the sidelines doing his best to calm his young swingman early in the game. After halftime, Hardaway's shot still wasn't falling, but he was able to engage himself in the game by drawing a pair of charges and driving with authority toward the basket. He was defending hard, playing with energy and finding a way to make an impact on a night where his scoring touch was lost. Hardaway genuinely seems like a team guy. When he's playing well, he's embracing his teammates and heaping credit on them whether they deserve it or not. When he's struggling, he's thanking them for bailing him out. However, he's developed a rough habit of allowing a few poor stretches to completely damage his psyche. His head dips, his body language sags and he seems to take himself out of the game before any opponent has a chance to. Prior to the MSU game, Hardaway remarked that the team needed to make sure it wasn't allowing itself to become "emotionally drunk" on the floor, meaning, Michigan had to keep a level head about itself throughout the ups and downs of a rather intense game. In order for Michigan to turn its road woes into victories, the Wolverines need their star swingman to heed his own advice. He needs to become emotionally sober. And if he is, there might not be a player in the building capable of slowing him down. Point guard B.J. 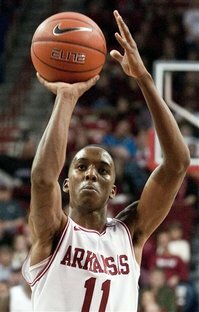 Young leads Arkansas' fast-paced offense. Arkansas coach Mike Anderson is a direct disciple of former national championship-winning Razorback boss Nolan Richardson, and not surprisingly, the styles are similar. Richardson was known for his "40 minutes of hell" defense, while Anderson has adapted the similar "fastest 40 minutes in basketball." Led by speedy freshman point guard B.J. Young, Arkansas wants to run, run more, then when you're tired, run even faster. Michigan averages 63.4 possessions per game, while the Razorbacks get 72.9. The Wolverines will likely do their best to slow the game and limit Arkansas' running attempts, but against a team this determined on getting up and down, the game's going to have spurts of speed. Against Michigan State earlier in the week, one of Michigan's keys was to get back quickly and limit any serious transition damage without fouling. The Wolverines did an excellent job of that, as Beilein routinely kept his guards away from the glass after missed shots to limit easy buckets. Get back, prevent easy buckets and force Arkansas to play uncomfortably in a half court setting. Michigan generally does a nice job of avoiding careless turnovers, but road environments can do crazy things to players. And, Arkansas' ability to cash in on lazy passes makes things more interesting. The Razorbacks aren't exactly playing Richardson's "40 minutes of hell" defense, but that's certainly the idea. Arkansas leads the Southeastern Conference in steals with an average of nine per game. And it's not just one player getting his hand on a few errant passes, either. Mardracus Wade leads the team with 31 steals, and Julysses Nobles (21) and Rickey Scott (20) both have more than 20, and three other players have at least 15. In all three of Michigan's previous road games, the Wolverines have found themselves in a quicksand-style moment. Meaning, everything that could've gone wrong did, and no matter how hard the team fought, things seemed to get worse. Against Virginia, Michigan's offensive went completely out the window in the second half and the Cavaliers took advantage with a 15-0 run. Nothing the Wolverines did worked, and eventually, UVA coasted to a 12-point victory. Against Indiana, the Wolverines started sluggish, allowing the Hoosiers to take advantage of their raucous home crowd to grab an early double-digit lead. Michigan fought back, but a stretch in the second half yielded the same result, with the Wolverines failing to limit Indiana's transition game before falling back behind by double digits. Michigan ultimately clawed back in the game and made things interesting, but IU's two big runs were too much to overcome. And against Iowa, well, that was a true nightmare. Trey Burke picked up two fouls in the game's first seven minutes, and the game was basically over from there. Michigan never recovered, never fought back and settled for its ugliest loss of the season. Michigan is winless in true road games this season. Sooner or later, that fact has to change. Otherwise, questions about just how good this club actually is will continue to linger. Sat, Jan 21, 2012 : 3:35 p.m. Props to Nick Baumgardner for incisive analysis...GO BLUE! Fri, Jan 20, 2012 : 3:33 p.m.
Michigan really needs Hardaway &quot;back&quot; in the offense. He's going through a classic sophomore slump (as is Smotrycz). Hopefully, both guys will break out of it quickly. This may be a good game for Hardaway to break loose. The run and gun style of Arkansas will open up a lot of open-court opportunities for Hardaway to take it to the basket, as well as open 3's. We'll see. Should be an interesting game. Fri, Jan 20, 2012 : 1:41 p.m.
Time to eat some bacon. Fri, Jan 20, 2012 : 11:34 a.m. Shouldn't the title read, &quot;Four things to watch, as the B1G TEN 1st place Wolverines get ready for Arkansas?&quot; Burke will thrive on the opportunity to guard another highly touted freshman guard in Young. Powell will be a challenge to defend. It will be interesting to see if Hardway gets the call on Powell or someone else? Sat, Jan 21, 2012 : 2:11 p.m. I think it is a bit soon to declare No.1 status for the Wolverines. They're doing great, but really? I like you're thinking, but it probably makes more sense the way it is since it's not a B1G game.